“I, the Lord, will forgive whom I will forgive, but of you it is required to forgive all men” (D&C 64:9-10). Isn’t that striking? According to this Mormon scripture, the Lord chooses whom he forgives while he commands people to forgive everybody. In this connection, many often point to the way Jesus concluded his parable about the unmerciful servant in Matthew 18. If you recall, after the servant refused to forgive the debt owed him by a fellow servant, the king had him thrown into prison. Then Jesus says, “This is how my heavenly Father will treat each of you unless you forgive your brother from your heart” (Matthew 18:35). It sure sounds like God won’t forgive us unless we forgive others. What people often forget is that in the parable it is the king who first forgives the unmerciful servant of his massive debt! 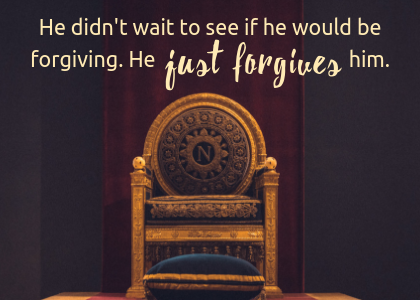 He didn’t wait to see if he would be forgiving. He just forgives him. That is the biblical message. “God was reconciling the world to himself in Christ, not counting people’s sins against them” (2 Corinthians 5:19). First God forgives. His forgiveness then creates a forgiving spirit in us. If a person doesn’t have a forgiving spirit, like the unmerciful servant, it is evidence they don’t have genuine faith. Having a forgiving spirit is one of the “works” indicating a person’s faith is not dead. First God forgives. His forgiveness then creates a forgiving spirit in us. Mormonism, however, flips it. First, we must be forgiving. Then we hope God will forgive us. As Echo Hawk said: “The teachings of our Savior and Redeemer, Jesus Christ, are clear: the sinner must be willing to forgive others if he or she hopes to obtain forgiveness.” Mormonism puts the cart before the horse. It changes the effect into the cause. Instead of forgiveness being a release, it becomes a burden. Mormon forgiveness is drastically different from biblical forgiveness. May we always appreciate God’s unconditional forgiveness. May we clearly reflect it and joyfully proclaim it. Countless are the people who desperately need to know about it.